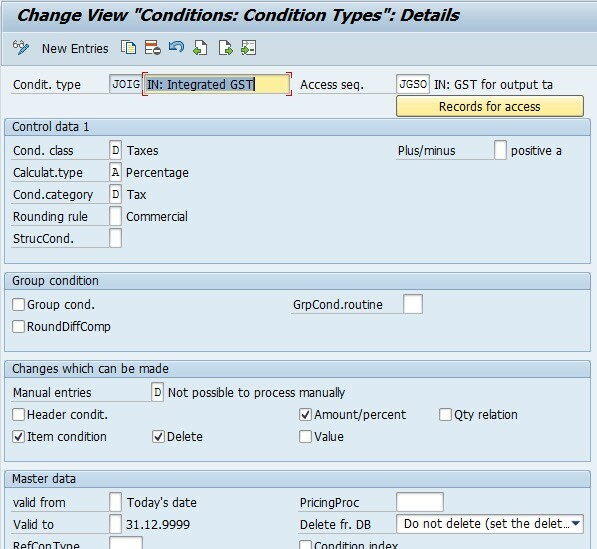 1) First using transaction code V/06 please create a GST condition type. Now as per as your business needs please assign the tax classification created in step 2 using the material master (MM02) transaction code. The tax classification will be assigned in Sales: sales org. 1 tab. 1) Please create a tax indicator for each and every material, this can be done in Customizing for Materials Management inside Purchasing->Taxes->Set Tax Indicator for Material. 2) Now please assign the tax indicator created in step 1 above in the material master MM02 transaction code in the Purchasing tab. 1) Under the identification tab of the customer master please enter the GSTIN number in the Tax Numbers block. In order to get the tax category IN3 for both customer and vendor, user need to maintain via views V_TFKTAXNUMTYPE and V_TFKTAXNUMTYPEC. 1) Now inside the Tax Number 3 field of customer master please enter GSTIN registration. New Segment (India: GST details) has been introduced under Vendor: Country Specific Ext. to maintain vendor tax classification. GSTIN registration number can also be defined for a business place. This GSTIN registration number can be defined in Customizing for Financial Accounting, under Financial Accounting Global Settings -> Withholding Tax -> Extended Withholding Tax -> Basic Settings -> India -> Define Business Places. Document is very usefull , Please giude me to get the India Tab in the PO screen in S4 Hana.